This interesting surname is of Anglo-Saxon origin, and has three distinct possible sources. Firstly, it may be a metonymic occupational name for a locksmith, from the Olde English pre 7th Century "loc", lock, fastening. The name may also be topographical from residence near an enclosure, a place that could be locked, from the Middle English "loke", a development of the Olde English "loca" The Middle English "loke" was used especially of a barrier on a river, which could be opened and closed at will, and, by extensions, of a bridge. The surname may thus also have been a metonymic occupational name for a lock- keeper. 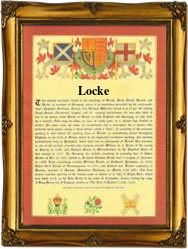 Finally, Locke may have originated as a nickname for someone with curly hair, from the Olde English "loc(c)", Old High German "loc", a lock (of hair). Early examples of the surname include: William de Lok, (Berkshire, 1230); William Lock, (Oxfordshire, 1273); and Robert Atteloke, (Cambridgeshire, 1300). Among the recordings of the name in London Church Registers are the christening of Joan, daughter of Mychaell Lock, at St. Giles' Cripplegate, on April 25th 1568, and the marriage of Robert Lock and Mary Baker on October 22nd 1572, at St. Dunstan's, Stepney. William Lock was an early emigrant to the American colonies, leaving London on the "Planter" in March 1634 bound for the Virginia Colony of New England. The first recorded spelling of the family name is believed to be that of Leuric Loc. This was dated 1130, in the "Pipe Rolls" of Warwickshire, during the reign of King Henry 1st of England, known as "The Lion of Justice", 1100 - 1135. Surnames became necessary when governments introduced personal taxation. In England this was sometimes known as Poll Tax. Throughout the centuries surnames in every country have continued to "develop", often leading to astonishing variants of the original spelling.